Steve Grieve Getting Into Blues Guitar PDF + Mp3 CD download. Intended for beginning to intermediate level players, this blues guitar tutorial offers progressive lessons addressing chords, comping, scales, phrasing, and solo improvising. The book’s numerous musical examples and tunes are written in both standard notation and guitar tablature as well as in chord grids when justified. All examples appear on the book’s companion CD, recorded on electric guitar only. Helpful practice tips and suggestions for further reading and listening are provided. 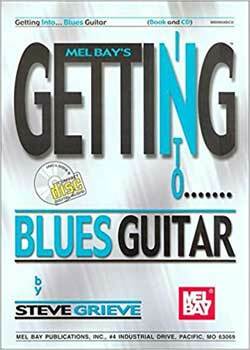 The author methodically introduces the student to authentic blues styles and techniques, referring to specific artists, recordings and periods in the development and evolution of modern blues guitar playing. The relationship between chords and soloing is examined, as is the role of the guitar in blues ensembles and recordings. Equal emphasis is placed on chord comping, improvising and related theory. Upon completion of the book the student should be competent in performing a wide range of blues forms and idioms, comping and improvising with authority, and playing the blues in a band or larger ensemble. Download Steve Grieve – Getting Into Blues Guitar PDF free and other books from our site. Only high quality PDF scans. Please write a review, it's important for our community.